Our moon was born of fire and violence. Virtually everything we see of it today, from its impact craters and mare to its mismatched hemispheres, was the result of world-shattering and world-creating events. These illustrations reveal what the Moon's history looked like. 4.5 billion years ago. Incoming planet: only moments remain before Theia, a planet the size of Mars, slams into the primordial earth. The big splat. The impact peels the earth like an orange. Titanic masses of material from both planets are thrown into space. The core of Theia eventually sinks to the center of our planet, where it remains to this day. For a short time, the earth is surrounded by a ring of debris. The ring is only temporary, however: it soon begins to coalesce into a solid mass. Only a few years might have been required for it to form into a moon. The surface of the nascent moon was largely molten as it formed from the accreting ring material. In the distance is the slowly healing earth. 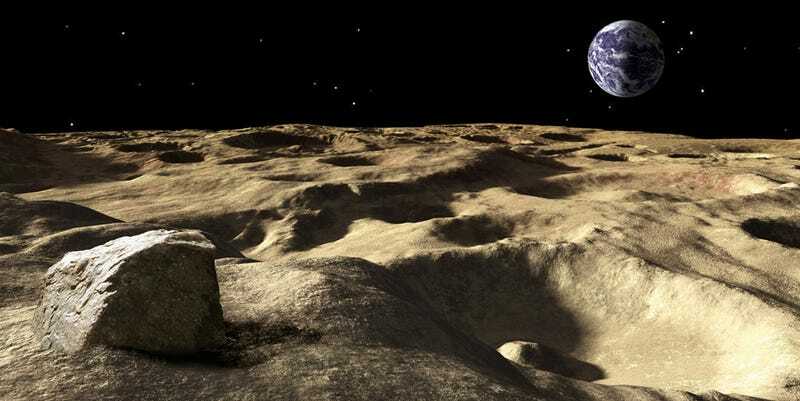 The surface of the moon is cooling. Its now-solid crust is interrupted by continuous vulcanism and lava flows. A cloudy earth is circled by the vanishing remnant of the ring. Our planet looks larger in the lunar sky than it does today because the moon is much closer. 1o million years later. Today's moon was not the only one formed from the ring. There were several others, orbiting at the Lagrange points. The orbit of one was not stable and it eventually drifted into the larger moon in a slow-motion impact that caused the smaller satellite to pancake, spreading itself over an entire hemisphere, creating the mismatched sides the moon has today. An unlucky witness to the "little splat" would have seen a tsunami of molten rock roaring up over the horizon. Millions of years of giant lava flows, created as asteroids puncture the lunar crust, result in the flat lava plains we see today as the lunar mare. One of these impacts—perhaps the largest endured by the moon since the little splat—created the South Pole-Aitkens Basin, one of the largest impact structures in the solar system. The date of the impact is uncertain: it might have occurred only a little over 3 billion years ago. If so, from the earth—where primitive algae would have been the only witness—the impact would have been an impressive sight.